North Korea has placed the Kim regime’s survival before any other priority. The ongoing war of words between the leaders of North Korea and the US has created international fears of a potential nuclear catastrophe. But each side’s actions go well beyond words. 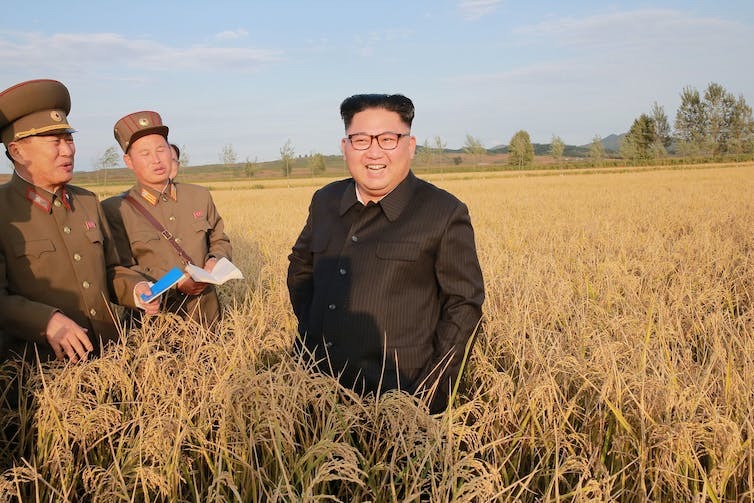 North Korea has conducted six nuclear tests since 2006, including its recent hydrogen bomb test and a spate of ballistic missile tests with ever-increasing range. The Trump administration, for its part, dispatched a naval armada to the region earlier this year, and recently conducted bomber flights close to the North Korean border. But with much attention focused on both sides’ military moves, and on the rigorous enforcement of economic sanctions against North Korea, there has been little focus on calls for a diplomatic solution. Where are we at currently? Recent statements by the Trump administration and allies such as Australia appear to assume the impact of sanctions, coupled with demonstrations of overwhelming military capacity, will secure North Korea’s unilateral back-down. Australia’s foreign minister, Julie Bishop, emphasised to the UN General Assembly recently that Australia would be vigorously pursuing sanctions of its own against North Korea. She argued such sanctions would “compel North Korea to abandon its illegal programs”. Absent in Bishop’s speech, however, was an equally emphatic commitment to pursuing a negotiated diplomatic solution. The most recent UN Security Council resolution against North Korea unanimously (China and Russia included) imposed a set of severe economic sanctions on the isolated country. Less noticed in the US-drafted resolution was a quasi-military imposition of a naval interdiction of vessels transporting prohibited items from North Korea. This opens the way to a naval blockade of the country comparable to that imposed on Cuba at the time of the Cuban Missile Crisis in 1962. It also potentially creates a further source of military confrontation with North Korea. At the same time, the resolution called for a diplomatic resolution of the crisis. This was little noticed in subsequent public debate. The resolution seeks a resumption of the Six-Party Talks involving China, North and South Korea, Russia and the US on the basis of negotiating verifiable denuclearisation on the Korean Peninsula, a commitment to peaceful resolution of the crisis, mutual respect of sovereignty, and economic co-operation. Sanctions played a key role in the successful multilateral negotiation of the Iran nuclear agreement. However, they may not necessarily have the same impact in the case of North Korea. Its regime has long cultivated the ethos of self-reliance, and has made regime survival its top priority. In this context, if war is to be averted, sanctions will need to be accompanied by a willingness to engage in substantive negotiations that might engage with the North Korean regime’s security and survival concerns. It is sometimes argued that North Korea has never responded positively to negotiations. However, the 1994 agreement brokered by former US president Jimmy Carter did result in a significant pause in the North Korean nuclear program. There was verified compliance of North Korea’s ceasing plutonium production from 1991 to 2003. The breakdown of the arrangement in 2003 was not wholly attributable to North Korea. The Bush administration’s delay in proceeding with agreed US oil shipments and full normalisation of political and economic relations played a key role. In the case of the current crisis, it is unrealistic to expect North Korea to immediately surrender its nuclear and missile capabilities. Instead, it is important to initiate, without preconditions, a negotiation process involving phases. Such a process would first seek an initial North Korean freeze on its current nuclear and missile testing programs in return for constraints on military drills close to its border. It would then move on to a possible longer-term resolution that tackles all parties’ legitimate security needs. economic and energy assistance to North Korea. Countries outside the region also have a key mediating role to play in breaking the current impasse on starting negotiations. Most recently, German Chancellor Angela Merkel has offered to play such a role, citing the process involved in the Iranian nuclear agreement. Rather than talking of being “joined at the hip” in support of any US military “solutions” to deal with North Korea, Australia too could be far more proactive and constructive in promoting and facilitating multilateral negotiations to avert a catastrophic war or nuclear holocaust.